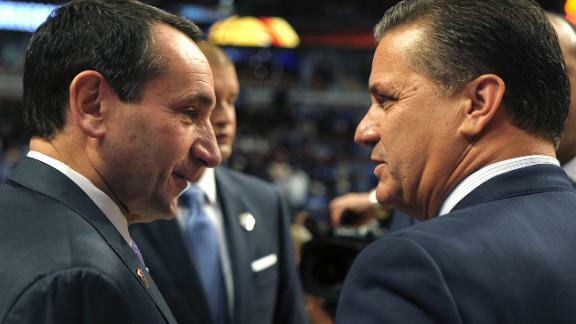 Final class rankings: Kentucky or Duke? ESPN national recruiting director Paul Biancardi joins Phil Murphy to break down the top 10 of the final college basketball class rankings for 2016. No. 1 SG Malik Monk discusses his McDonald's All-American Game selection with ESPN's Phil Murphy and how Monk plans to grow as a player before joining Big Blue Nation. Recruiting Nation's Matt Schick and Paul Biancardi break down Kentucky's 2016 recruiting class and highlight the top recruiting teams of this year. Wenyen Gabriel, No. 23 overall in the ESPN 100, was down to five schools: Connecticut, Duke, Kentucky, Maryland and Providence. He joined ESPN's Adam Finkelstein to announce his commitment Thursday morning.